Ptarmigan Time or should I say Ptarmigan Ptime. After looking at my last post, I realized I didn't have the feeling of the fog-laden tundra I wanted. Also, the left bird's head was not distinct enough from the background. I didn't want him "popping" from the background like the other bird, but he needed more. These two issues could have one solution. If I glazed the background with a cool blue, I could create fog and the cooler color around the bird's head would make his warm head stand out from the background. This glazing would be a bit tricky. In order to create the sensation of fog on an uneven terrain in close quarters, I didn't want a smooth and even glaze. The fog needed to "settle" more heavily in some areas than others. Also, the upper right would need more to create the feeling of distance. To accomplish this fog illusion I brushed on liquin mixed with King's Blue, paynes gray, and Titanium white and let it dry. The next day I added another coat changing the color slightly depending on the area. The next day, another coat. By putting on the layers slowly, I could carefully plan my fog. If you didn't guess the birds from the last post, they are ptarmigan. I saw a flock along the Denali Highway in Alaska. Fog was hanging low in the rolling tundra landscape. There were young of this year and adults and my 30 minutes with them was special. If I didn't move, one or more would come closer and pose. Time for a bird painting. 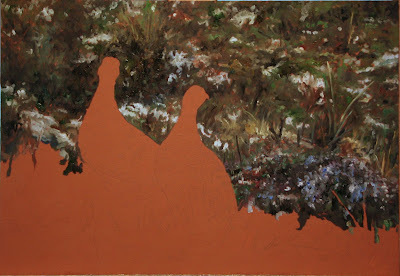 Wanting to paint a pair from the north country, below is the start of the piece. Maybe you can guess what birds they are. This piece is inspired by some time in the tundra. I find this type of terrain fascinating. It may seem fairly flat but it is filled with rolling edges, tiny plants, short grasses, lichen, and wild berries including blueberries, raspberries, cloud berries, cranberries (which are wonderfully edible as is), soap berries and more. 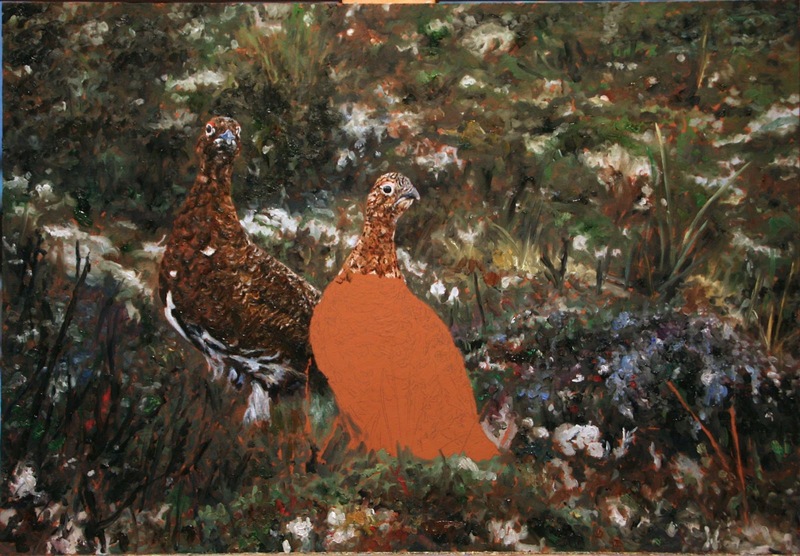 Of course it would be easier to paint this pair in snow but then this multi-hued landscape would be covered. 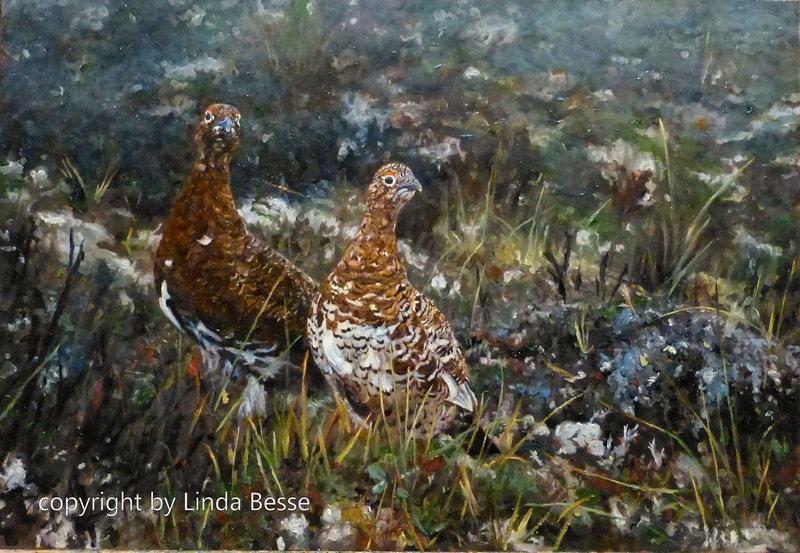 When I began this piece, I blocked in the background grasses first and painted a base for the foreground grasses. 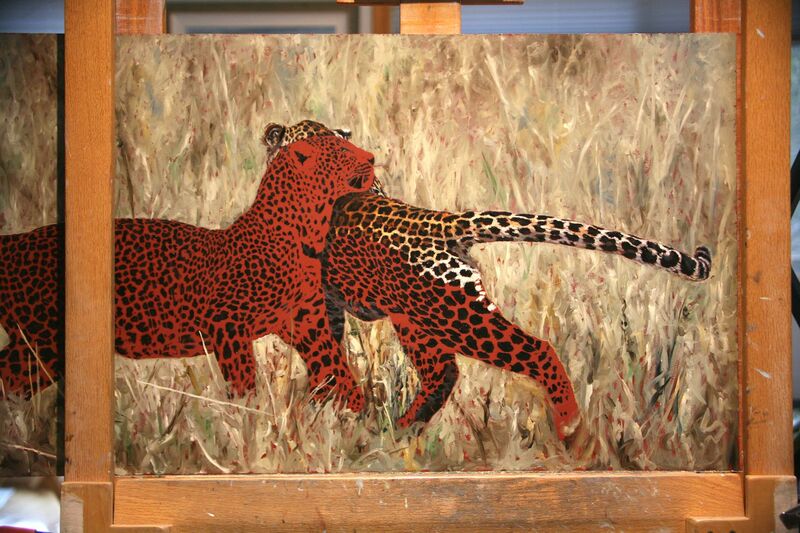 After living with the painting for a while, the background grasses didn't feel right. Some blades were too defined and drew attention from the cats and the overall color was a bit dreary. I just wasn't buying it. Wanting to keep some of the feel of the grasses especially on the right side above the cat's tail, I used naples yellow as a base and glazed the whole top half with liquin. As I moved across the painting some glazed sections have raw umber, more yellow, some grays. After one coat, I knew it wasn't enough. 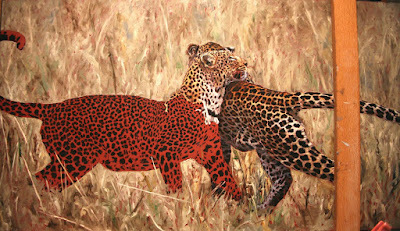 Yes, it lightened and had the desired effect of softening the look but it only went part of the direction I envisioned. Next step: finish the foreground grasses. The center section is almost done. Usually I would continue on the female's body and paint her tail last but I decided to move to her tail to set the lightest color in the painting. With the tail complete, it was obvious to me the fur under her neck and onto her chest needed to be lightened. Taking the tail's "white" (titanium white and cadmium yellow deep) and adding a little bit more cadmium yellow deep, I brushed more highlights on her chest. To make the new highlights stand out, I also added more shadow color (titanium white, cerulean blue, ultramarine blue, raw umber, paynes gray.) Not only does her brighter chest now balance better with her tail but it also further defines her space from her partner's. Once I have more of the second cat blocked in, I'll revisit the section just above her ear to see if I need a greater separation between the two cats. 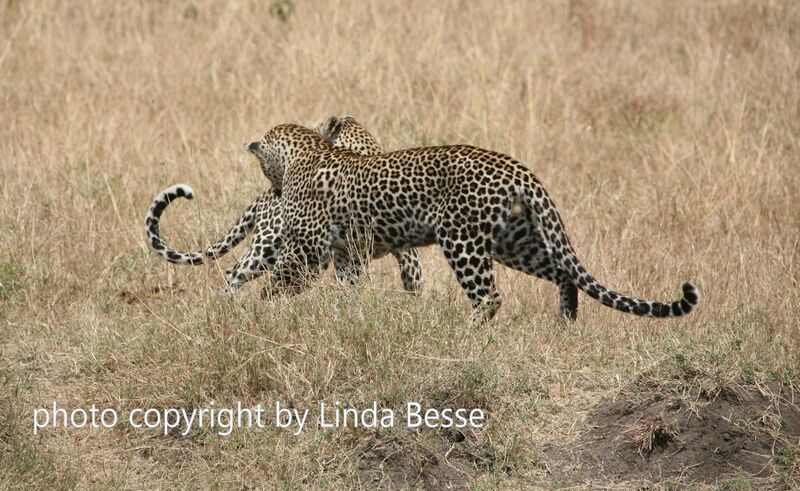 In 2009 I had the good fortune to spend some time with a pair of mating leopards in Kenya's Masai Mara. It is such a rare occurrence to see two adult leopards together. The three of us (guide, one of my collectors, and I) were very careful not to interfere with their normal behavior. 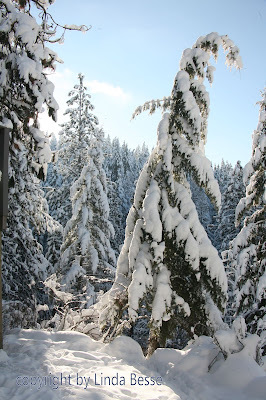 Below is one of my reference photos. This is the fun part for me. It is almost as if my paintbrush is the sun. By playing with color, lights and darks, I can give volume to a flat surface. There is a variety of color in the background grass but I kept it fairly neutral so the oranges on the cats would stand out. I took this photo outside my studio the last day of 2015.
let us look for the glory all around us. May your 2016 be filled with wonder, joy, & peace.